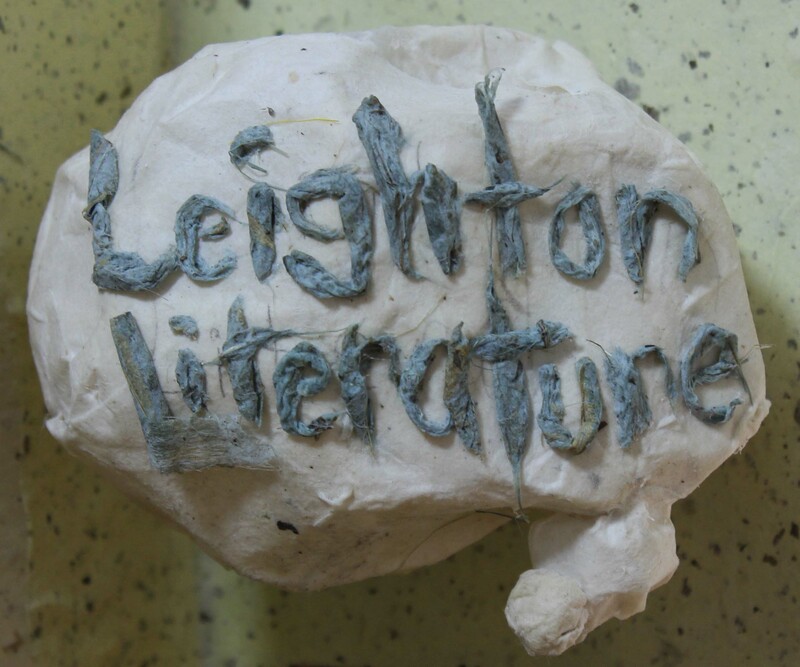 Reading from China? This My 5 contains YouTube videos, which can only be viewed with a VPN! 1. February 2019. There are a bunch of cool spots you can head to around Tokyo for amazing city views. For most people the location of choice is Tokyo Skytree with its stupendous (not to mention stupendously expensive) city views. However, more economically minded folk say “screw that” in favor of the free views at The Tokyo Metropolitan Government Building. In the end I didn’t scale either, as nothing could beat the private panoramic from my bedroom window at Park Hyatt Tokyo. But as my Tokyo trip edged towards the end I realized there was still one more view-toting city structure I’d yet to see. Enter the iconic Tokyo Tower! 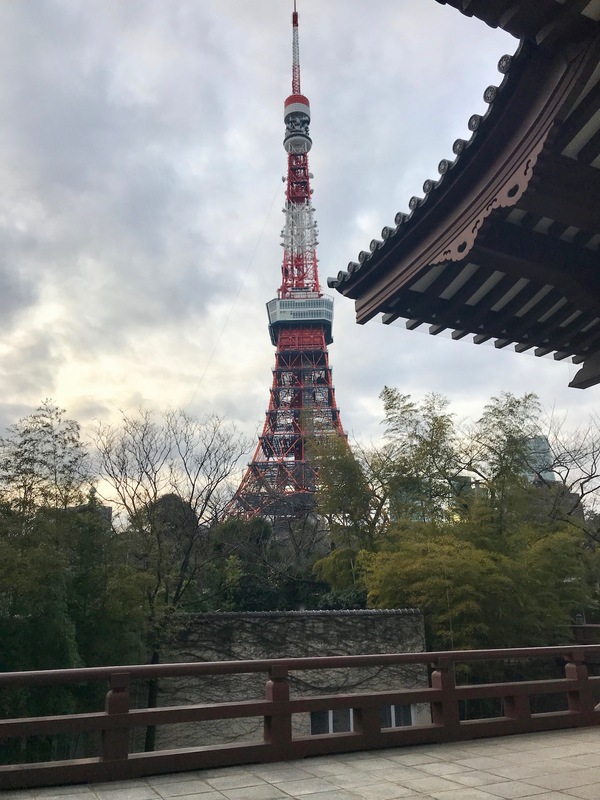 Once again I had zero interest in actually going up to the top; instead I was simply keen on seeing the tower as a dramatic backdrop to the historical Zojoji Temple. Zojoji Temple & Tokyo Tower. 2. February 2019. 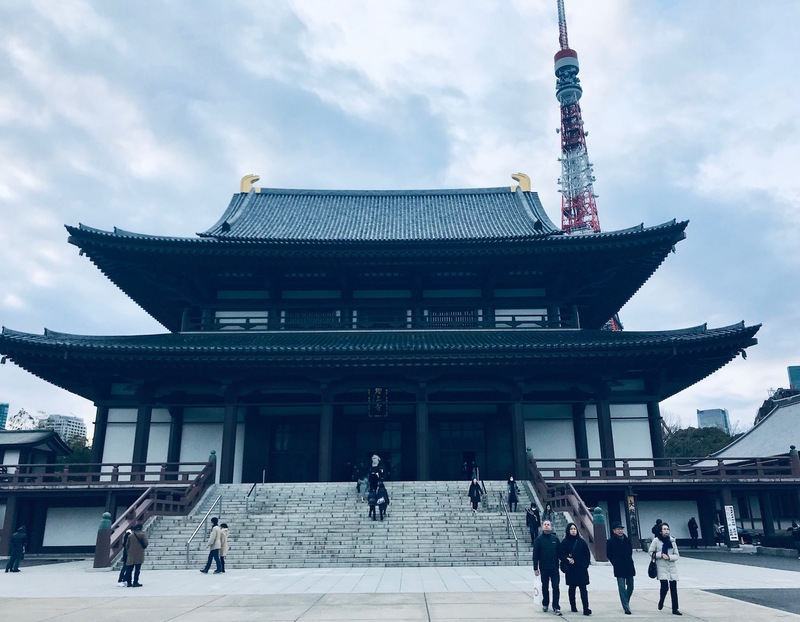 Beautifully melding Tokyo’s sleek modernity and graceful past, that first angle of Zojoji Temple and Tokyo Tower as you walk through the main gate is a lovely moment. It was so grey and dark that afternoon, which only added to the theatrical feel of the place as I approached the temple through the vast courtyard and up the steps to the entrance doors. Zojoji dates back to 1393 and later became the family temple to Japanese ruler Tokugawa Ieyasu. Tokyo Tower meanwhile, clearly heavily influenced by The Eiffel Tower in Paris, was constructed in 1958 and today broadcasts signals for a whole host of Japanese media outlets. 3. February 2019. Zojoji Temple’s interior is nothing special in all honesty, at least not for someone like me who’s seen countless temples around Asia. But it was cool that I’d arrived in time for some Buddhist chanting, with a group of locals drumming along to the lead of a resident temple monk. Hypnotizing stuff! Tokyo Tower from the Children’s Deity Garden, Zojoji Temple. 4. February 2019. 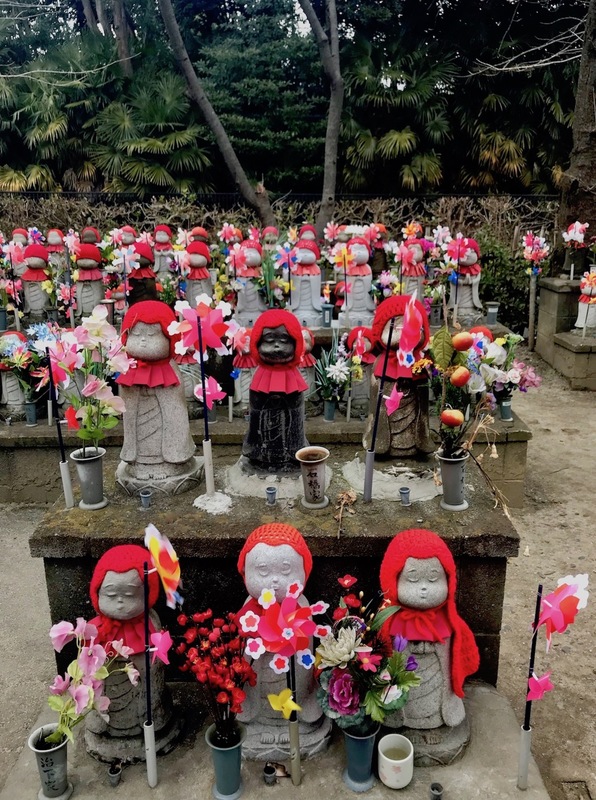 Much more interesting than the bland interior is Zojoji Temple’s adjoining Care Deities of Children Garden. 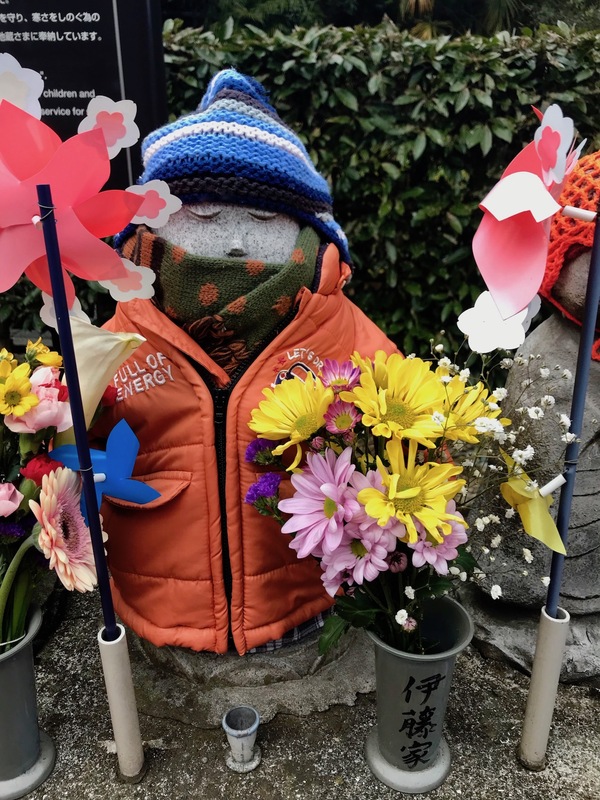 Home to over two hundred statuettes, the garden is dedicated to the safety of children’s growth and also serves as a memorial for still births and miscarriages. Care Deities of Children Garden, Zojoji Temple. The red hats and aprons are to provide the little statues with warmth and “general protection”. I did see a few middle-aged women praying here. It was a curious sight, even more so with Tokyo Tower looming large in the background. Tokyo Tower from Zojoji Temple. 5. February 2019. Scoot round to back of the temple for more cool views of Tokyo Tower from the balcony. Not many people seem to know about this, so it’s a great spot for a bit of peace away from the crowds. Zojoji Temple is free to enter daily (except Tuesdays) between the hours of 09:00-16:00. The nearest subway station is Daimon on the Oedo Line. Take Exit A1, it’s a nine-minute walk from there. 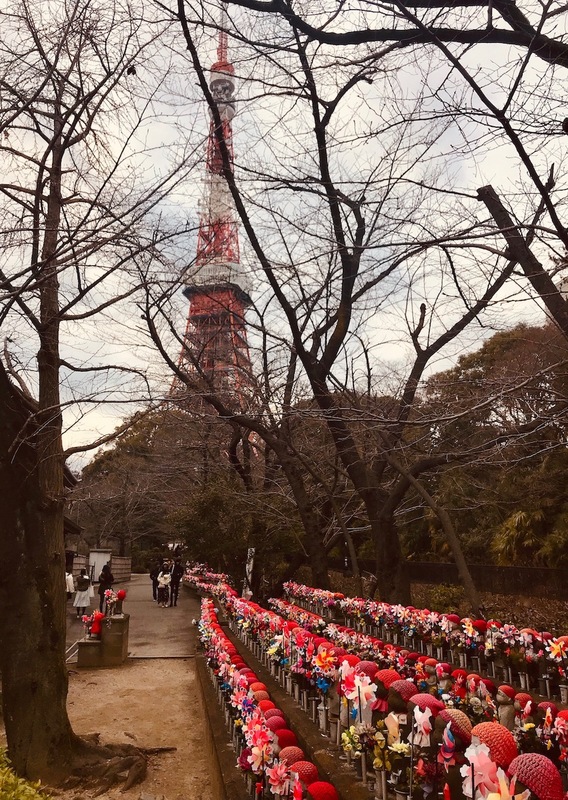 If you wanna get right up close to Tokyo Tower and maybe even actually go up it’s a straightforward seven-minute stroll from Zojoji Temple to the tower’s entrance. Showing up and paying at the door isn’t advised as the queues here are usually pretty bad, so its best to pre-book through any number of online operators. Klook for example do main observatory tickets at 900JPY (£6.20/€7.15/$8). My 5: Golden Gai Bar District – Shinjuku, Tokyo.